British Airways announced the start of a new summer route from London's Heathrow Airport to the Greek island of Kefalonia. The service will operate from 15th May until 6th October 6, 2018, and will link dull old London town with some of Greece’s best beaches and the idyllic setting to Louis de Bernieres’ novel-turned-film Captain Corelli’s Mandolin. Flights will depart on Tuesday and Saturdays, with return fares starting from £118 in Euro Traveller and £398 in Club Europe. 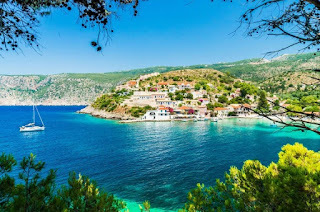 Earlier this month British Airways announced it would start flying between Heathrow and Corsica, with direct flights to Figari airport operating every Sunday from May 27 until October 7 and return fares starting from £98. A new route to the historic Spanish city of Almeria will also launch with flights taking to the skies from March 27, 2018. Holidaymakers can discover this lively town and spectacular surrounding coast from just £66 return.